an independent judiciary and legal profession to protect citizens against the arbitrary use of power by the state, individuals or any other organisation. "His Majesty was not learned in the laws of his realm of England, and causes which concern the life, or inheritance, or goods, or fortunes of his subjects, are not to be decided by natural reason but by the artificial reason and judgment of law, which law is an act which requires long study and experience, before that a man can attain to the cognisance of it: that the law was the golden met-wand and measure to try the causes of the subjects; and which protected His Majesty in safety and peace." In the Indian Constitution, Rule of Law has been adopted under the Preamble where the ideals of justice, liberty, equality and fraternity are enshrined. The Constitution has been made the supreme law of the country and other laws are required to be in conformity with the Constitution. Nonetheless, the courts have the onus to declare any law invalid, which is found in violation of any provision of the Constitution. Part III of the Constitution of India guarantees the Fundamental Rights. Article 13(l) of the Constitution makes it clear that all laws in force in the territory of India immediately before the commencement of the Constitution, in so far as they are inconsistent with the provisions of Part III dealing with the Fundamental Rights, shall, to the extent of such inconsistency, be void. Article 13(2) provides that the State should not make any law, which takes away or abridges the fundamental rights and any law made in contravention of this clause shall, to the extent of the contravention, be void. The Constitution guarantees equality before law and equal protection of laws. Article 21 guarantees right to life and personal liberty. It provides that no person shall be deprived of his life or personal liberty except according to the procedure established by law. Article 19 guarantees six Fundamental Freedoms to the citizens of India viz. freedom of speech and expression, freedom of assembly, freedom to form associations or unions, freedom to move through any of part of territory of India freely, freedom to reside in any part of the territory of India and freedom of profession, occupation, trade or business. The right to these freedoms is not absolute, but subject to the reasonable restrictions which may be imposed by the State. Article 20(1) provides that no person shall he convicted of any offence except for violation of a law in force at the time of the commission of the act charged as an offence not be subject to a penalty greater than that which might have been inflicted under the law in force at the time of the commission of the offence. According to Article 20(2), no person shall be prosecuted and punished for the same offence more than once. Article 20(3) makes it clear that no person accused of the offence shall be compelled to be witness against himself. In India, the Constitution is supreme and the three organs of the Government viz. Legislature, Executive and Judiciary are subordinate to it. It provides though for encroachment of one organ (e.g.Legislature) upon other (e.g. Judiciary) if its action is malafide, and the citizen (individual) can challenge under Article 32 of the constitution if the action of the executive or legislature violates the fundamental rights of citizens before the judiciary. “The rule of law as a principle contains no explicit substantive component like eminent domain but has many shades and colours. Violation of principle of natural justice may undermine the rule of law resulting in arbitrariness, unreasonableness, etc. but such violations may not undermine the rule of law of law so as to invalidate a statue. Violation must be of such a serious nature which undermines the very basic structure of the constitution and the democratic principles of India. But once the court finds, a statue undermines the rule of law which has the status of a constitutional principle like the basic structure, the said grounds are also available and not vice versa. Any law which in the opinion of the court is not just, fair and reasonable is not a ground to strike down a statute because such an approach would always be subjective not the will of the people because there is always a presumption of constitutionality for a statue. A reappraisal of the role of law, and of the functions of the lawyer is needed in the great majority of nations that have though, not recently but, not that long have acquired political independence. The characteristic feature of an under-developed or rather I would say a developing country is the stark gap between its economic and social state and the minimum aspirations of a mid-twentieth century state modelled upon the values and objectives of the developed countries. All these countries including ours have an overwhelming need for rapid social and economic change, much of this must express itself in legal change - in constitutions, statutes, and administrative regulations. Law in such a state of social evolution is less and less the recorder of established social, commercial and other customs; it becomes a pioneer, the articulated expression of the new forces that seek to mould the life of the community according to new patterns. In the type of society - which the under developed or developing countries represent most radically, though by no means exclusively - it is essential to reassess not only the functions of law but the role of the lawyers. 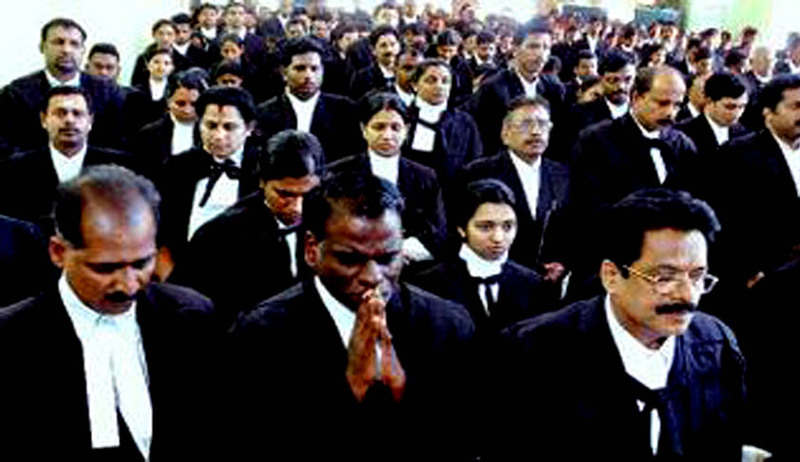 In the tradition of India, the lawyers have contributed to the development of the legal system, and thus in some way to the development of society, mainly as judges, advocates and jurists. Lawyers have also been concerned with the legislative change - as a member of Parliament, as an expert in a government department, or as a parliamentary draftsman. But generally, if we see the present scenario the lawyer has been a defender of the established order and of vested interests, for the simple reason that in a society dominated by commerce and industry the individual and corporate owners of property have been the principal clients. Correspondingly, the role of the lawyer has been generally more important in the shaping of private than of public law. With regard to individual liberties the lawyers, especially in criminal and administrative processes, has often been a vital defender of liberties against official arbitrariness. The continuing importance of the lawyers’s function as a defender of both personal and economic rights against arbitrary interference can hardly be exaggerated. In these days of right and left wing rulership, the stifling of open discussion, and confiscations of both national and foreign property interests, the protection of the legitimate interests of the individual, and most especially of his personal liberties as expressed in the minimum requisites of due process, remains one of the most important and noblest of the lawyers’s functions. But it is no longer sufficient. If the lawyer continues to be identified, as he predominantly is at the present time, with the defence of the existing order and of vested interests of societies that must lift themselves from poverty and stagnation to a radically higher level of economic and social development, often within a desperately short time, the lawyer will eventually be reduced to an inferior and despised status in the developing nations. The contemporary lawyer in all states, but most emphatically so in the developing nations, must become an active and responsible participant in the shaping and formulation of development plans. He must guide and counsel but also warn where necessary. He must acknowledge the drastically increased role of public law in developing societies, which usually have inadequate resources, a totally inadequate quality and quantity of responsible private venture capital, gross educational deficiencies and insufficient technical skills and administrative experience. These nations must plan for their future; they must seek to use and develop their resources for the maximum benefit of the community, even where they admit and desire a large share of private investment and enterprise. The legal profession is a profession of service. In maintaining the rule of law, it gives vitality to the peace and order, the freedom and the decency, of the society in which we live. Sometimes that may be an anxious duty, sometimes difficult to perform. Function of the law in the developing countries of our time that the lawyer can hope to retain or even broaden the role that he has traditionally played in the countries of the Western world. As Thomas Paine said, “…the law is king. For as in absolute governments the King is law, so in free countries the law ought to be king; and there ought to be no other.” It is only in this way that he can help to move the ideal of the “rule of law ” from the static and defensive meaning it has tended to acquire in the Western world, and to adapt it to the needs and ideals of our time - which make economic and social development a paramount matter of public national and international responsibility. Mohit Sharma is an Advocate @ High Court of Himachal Pradesh, Shimla.